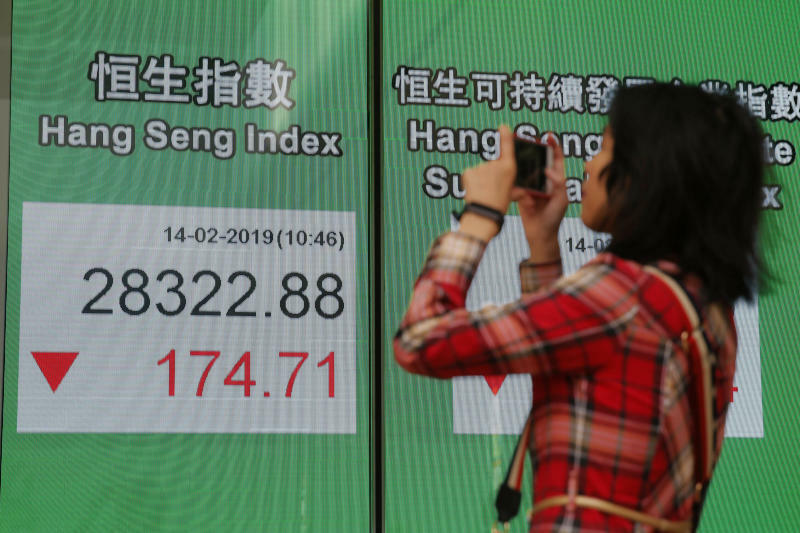 SINGAPORE (AP) — European shares rose Thursday and Wall Street was set to open higher after the U.S. and China kicked off two days of trade talks in Beijing. The aim is to forestall further tariff hikes in a bruising dispute over Beijing's technology policies. In Europe, France's CAC 40 gained 0.7 percent to 5,110 and Britain's FTSE 100 rose 0.3 percent to 7,212. Germany's DAX added 0.3 percent to 11,204, even as the country reported that it only narrowly avoided a recession in the fourth quarter with zero growth. On Wall Street, the future contract for the S&P 500 index rose 0.3 percent to 2,758, while future contracts for the Dow Jones Industrial Average climbed 0.4 percent, to 25,591. Barring a breakthrough, the U.S. is set to raise tariffs on $200 billion in Chinese goods on March 2. U.S. President Donald Trump has hinted that he might refrain from that increase if negotiations make enough progress. On Wednesday, Trump told reporters discussions were "going along very well." A Bloomberg report, which cited unnamed people familiar with the matter, said Trump was mulling a 60-day extension. "A partial deal or at least an extension of the deadline followed by a deal on some key issues seems likely," wrote Holger Schmieding, chief economist at Berenberg Bank, in a note to investors. "If so, it would largely remove the risk of an escalating U.S.-Chinese trade war." On Thursday, China said its exports expanded 9.1 percent in January from a year earlier to $217.6 billion, reversing a decline in December. But its exports to the United States fell 2.4 percent to $36.4 billion and imports from the U.S. plunged 41.2 percent to $9.2 billion. The country's overall imports dropped 1.5 percent to 178.4 billion. 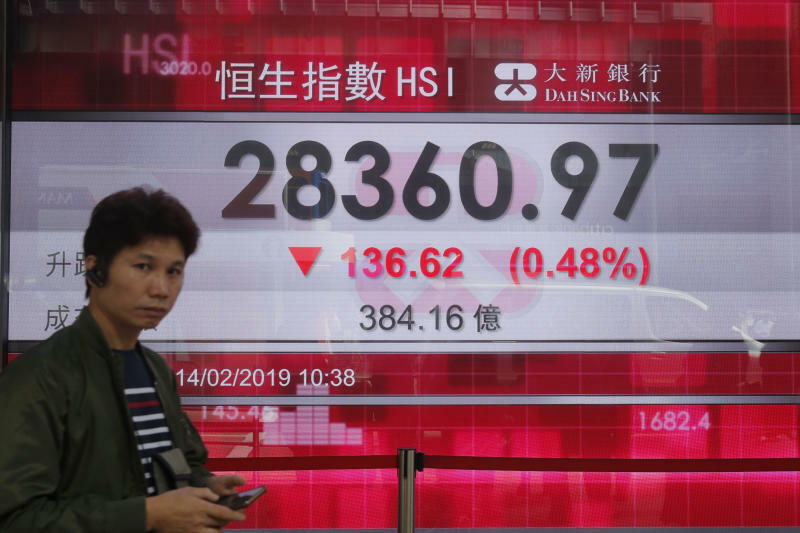 THE DAY IN ASIA: Hong Kong's Hang Seng edged 0.2 percent lower to 28,432.05. Australia's S&P/ASX 200 shed 0.1 percent to 6,059.40 while the Kospi in South Korea rebounded 1.1 percent to 2,225.85. The Shanghai Composite index dropped 0.1 percent to 2,719.70. Japan's benchmark Nikkei 225 finished almost flat at 21,139.71, despite preliminary data showing that its economy grew by 1.4 percent in 2018's fourth quarter, helped by strong domestic demand. 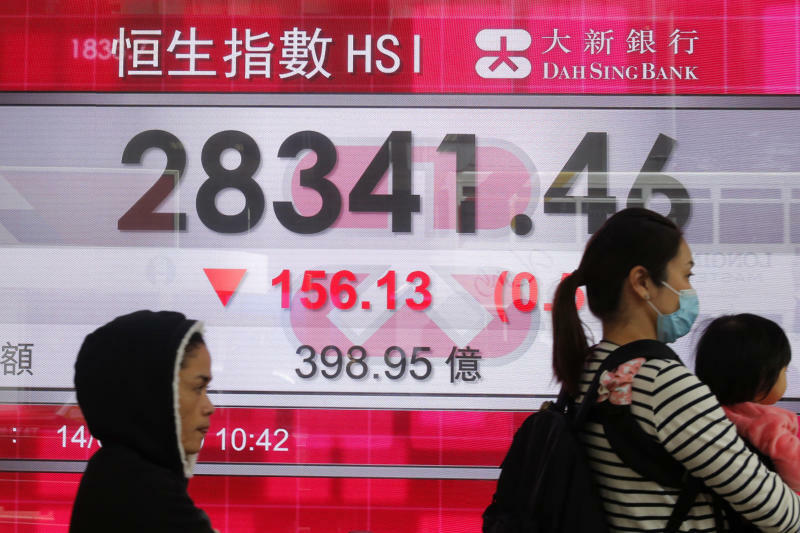 Shares were flat in Taiwan but rose in Singapore and the Philippines. ENERGY: U.S. crude rose 62 cents to $54.52 per barrel in electronic trading on the New York Mercantile Exchange. It picked up 80 cents to settle at $53.90 per barrel in New York on Wednesday. Brent crude, used to price international oils, gained $1.04 to $64.65 per barrel. It added $1.19 to close at $63.61 per barrel in London on Wednesday. CURRENCIES: The dollar rose to 111.07 yen from 110.98 yen late Wednesday. The euro climbed to $1.1271 from its previous close of $1.1261.